WASHINGTON, D.C. – July 2, 2013 – Northrop Grumman (NYSE:NOC) logistics experts met at the National Press Club June 25 to discuss how mission execution, effectiveness and innovation for affordability are defining the company's performance and growth in this critical segment of the corporation's overall business. A photo accompanying this news release is available at http://media.globenewswire.com/noc/mediagallery.html?pkgid=19690 . A media kit is available at http://www.northropgrumman.com/MediaResources/MediaKits/InnovativeLogisticsSolutions/Pages/default.aspx . "Northrop Grumman's 80 years of experience in delivering logistics support to our customers globally makes us uniquely qualified to advance the next generation of logistics technologies and innovative business practices to increase mission readiness and drive affordability," said Chris Jones, corporate vice president and president, Northrop Grumman Technical Services. Jones said Northrop Grumman's customers must sustain systems longer than planned and perform modernization to maintain operational effectiveness. As a result, the company anticipates strong, steady future business opportunities. "Our expertise in logistics is also an enabler for our three other key business arenas of unmanned systems, cyber and C4ISR," he added. Harnessing innovation at the front end of the life cycle is critical to ensuring that a weapons system will remain relevant in the decades ahead. With that in mind, Northrop Grumman's systems and logistics experts are focused on delivering more value over the long term. "Logistics begins with a design process that understands how the system will operate, be maintained and be modernized over its life cycle," said Tom Moore, director, systems engineering and logistics, Northrop Grumman Electronic Systems. "We are embracing modular open systems architectures to enable collaboration and provide for adaptable and affordable systems over their life cycle." 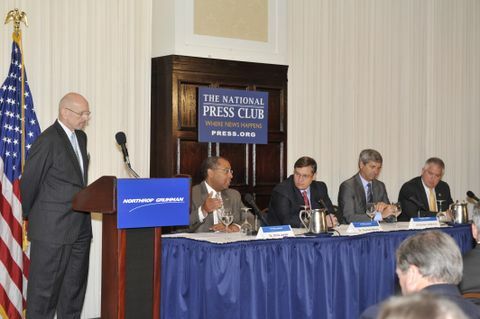 "Because the majority of the cost of a military system is in sustaining and modernizing that product over its entire life cycle – versus research, development and production – finding new ways to innovate to increase affordability is essential to our customers," said Jim Zortman, sector vice president, global logistics and operational support, Northrop Grumman Aerospace Systems. "We're doing that across the entire spectrum of logistics." Beyond designing a more powerful logistics function into weapon systems to increase effectiveness and create more affordability, Northrop Grumman's logistics teams are improving system availability and driving higher mission execution rates by modernizing through sustainment. "The work we are doing on the United Kingdom airborne warning and control system Sentry program is a great example of how we are successfully managing the total life cycle of a system already in operation. By incorporating sustainment practices that enable modernization and through strong customer partnering, we are able to keep the system highly relevant and our customers can invest as they need to," said Steve Hogan, sector vice president and general manager, integrated logistics and modernization division, Northrop Grumman Technical Services. "This style of managing the logistics program has helped maintain high mission readiness levels."